When I visited Nanny Hand last weekend she had some pictures of her wedding on the mantelpiece, which I had never seen before. This was (I think) 1949. This picture is inspiring for me in several ways. 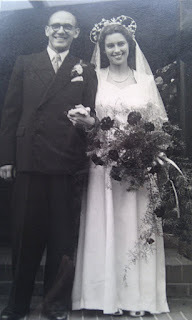 Firstly, my grandparents had an amazing relationship that lasted from their early teens until he passed away at the age of 79. Definitely something to aspire to. Secondly, I love the style! I love the sweetheart neckline and the peeptoe shoes, and the headpiece. Finally, when I told Nanny Hand I liked the headpiece she told me somebody leant it to her and she didn't much care for it. This inspires me to let go of the fact I didn't like the shoes I wore for my own wedding. In 50 years, somebody might be picking them out as their favourite feature in the pictures. Here are all my yule tree cones so far. They need felting, but I'm waiting until I have enough for three trees before I felt, so they all felt the same amount. Inspired by a post I read about boot socks, I have been rocking this look lately. I've always been a spots girl but stripes are slowly creeping into my wardrobe and I am becoming more and more fond of them. When it's cold, this is my favourite snug thing to wear. The Central Park Hoody. This was the first garment I ever knitted. The sleeves are ever so slightly long and it is super warm and has a hood, so it's perfect for chilly days or for wrapping up at home. When I eventually got round to adding the button band (this took, no word of a lie, 2 and a half years) I put buttons right up into the hood, so I can button it up over my chin. This is just comfort in a sweater. I can't believe the designer didn't intend for there to be buttons on it: it's way better with the buttons. textures in this rock. It had a twin which was missing its yellow sandstone top - evidently worn away by the crashing waves. There were round rocks and layers of rock and jagged rocks, and some very interesting weathering patterns. The 12 Apostles might have been more spectacular, but they didn't have the textural interest this rock had. If you'd like to play, or see anybody else's pictures, please pop over to see Emma at the Gift Shed.